We all know of Yell as a clothing brand but this time we headed to Yell not for my clothing needs but for my food needs. Yes, the new age boutique café, Café Yell founded by Vipul and Divya Gupta is the new hub at Defence Colony. Located above Yell showroom, Café Yell is made in the form of an Italian style café that focuses quite simply on excellent coffee, great food and hospitable service. Though the first look of the café seemed as if we have entered a fancy tailoring shop or a designer’s studio! 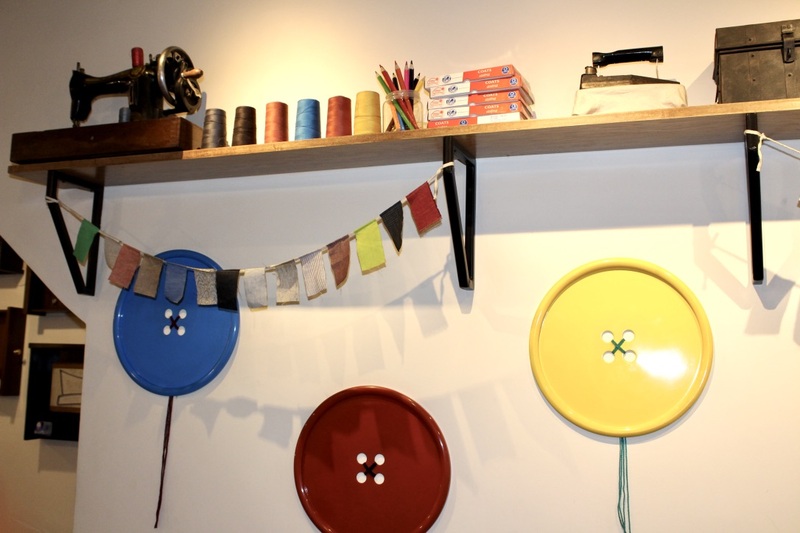 Various items of tailoring and fashion can be seen across the walls and ceiling – colourful threads, sewing machine, hanger lamps, clothes, colour pencils, iron, small trunk and big colourful buttons. Each element was distinctively present against the white walls of the cafe. There was also a man and women model wrapped with wool blends. Wooden couches with red backrest on one side with purple and red chairs seated us comfortably. A look at the menu conveyed that the place offers a combination of snacks and meal items and is perfect for a quick bite as well as a long conversation with family or friends. We excitedly placed our order selecting different dishes from various sections and delighting our tastebuds. We started with Roasted Tomato and Basil Soup. 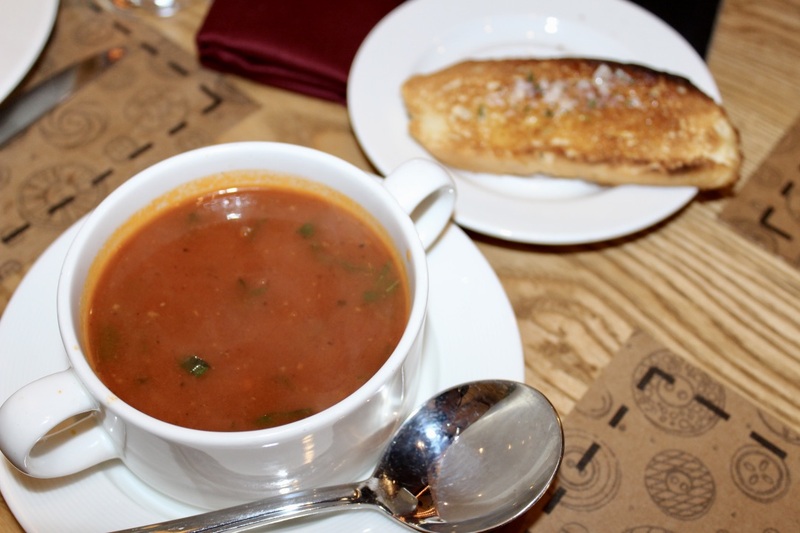 Served with a slice of garlic bread, basil along with tomato did the trick giving a nice comfort feel to our throat. 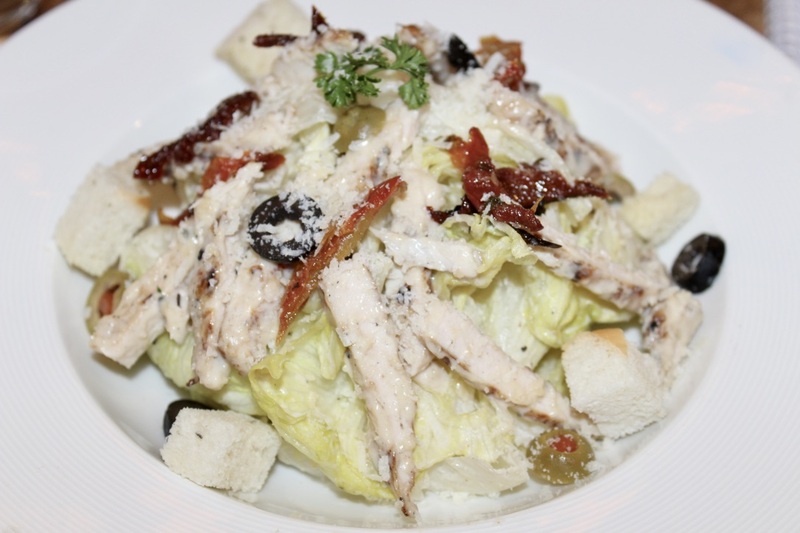 Caesar Salad (Chicken) was a refreshing and nutritious blend of chilled iceberg, olives, sundried tomato, tossed in Caesar dressing along with croutons and parmesan and a generous portion of shredded chicken breast. We really enjoyed this one. Jumping on to Let’s Start section, Harissa Cottage Cheese looked like an interesting dish for a paneer lover like me. 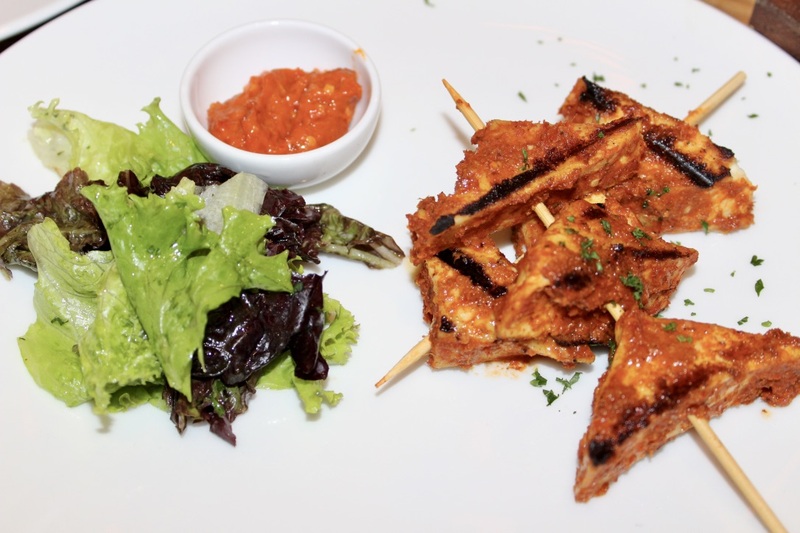 Though it was well presented and was tempting but the grilled cottage cheese triangles were too spicy to my delight. 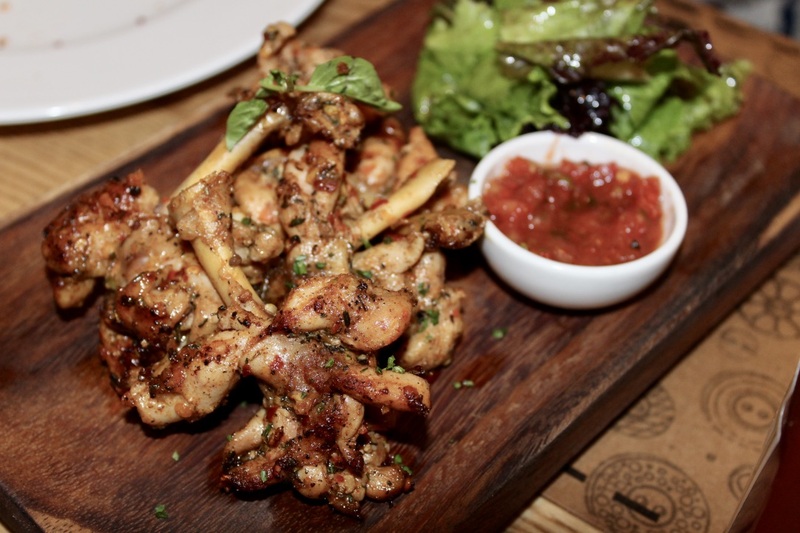 The Spiced Chicken Drumsticks from the same section were served well which made it so convenient to eat. Chargrilled and marinated in Cajun spice, the mild flavours were a delight. They were served with yell sauce on a wooden plank-like-plate along with lettuce! 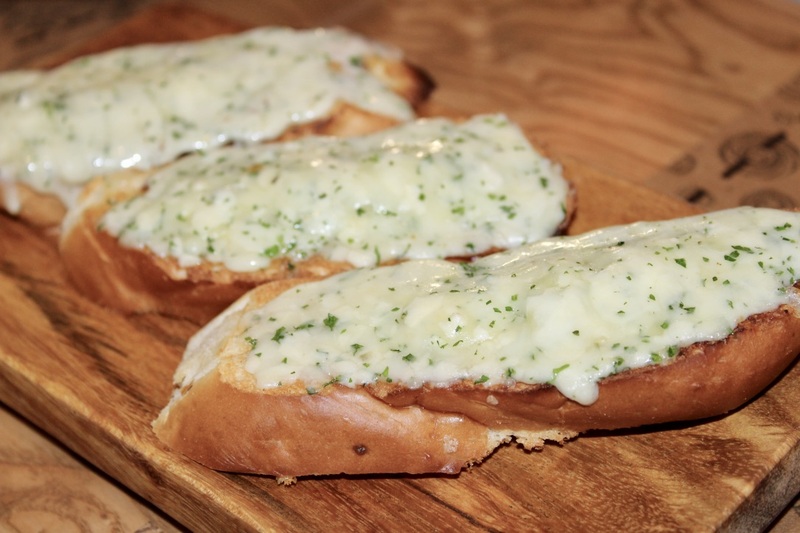 The Original Garlic Bread was oven baked, brushed with special herbed butter and had the perfect crunch. The melt-in-mouth cheese was layered generously giving us a yum taste. 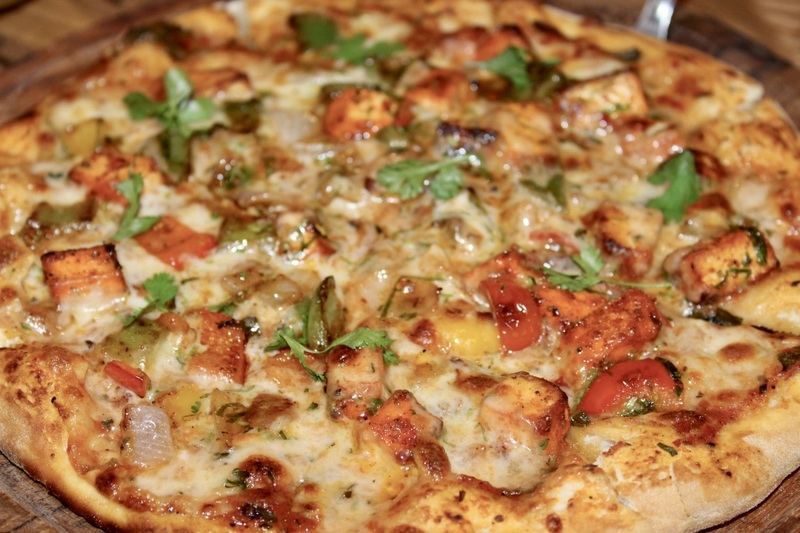 Heading to the Pizza Section, we chose the Paneer Tikka Pizza loaded with small cubes of cottage cheese, bell pepper, roasted onions, yell sauce and our favourite mozzarella! Perfectly baked, right flavours and an absolute delight! 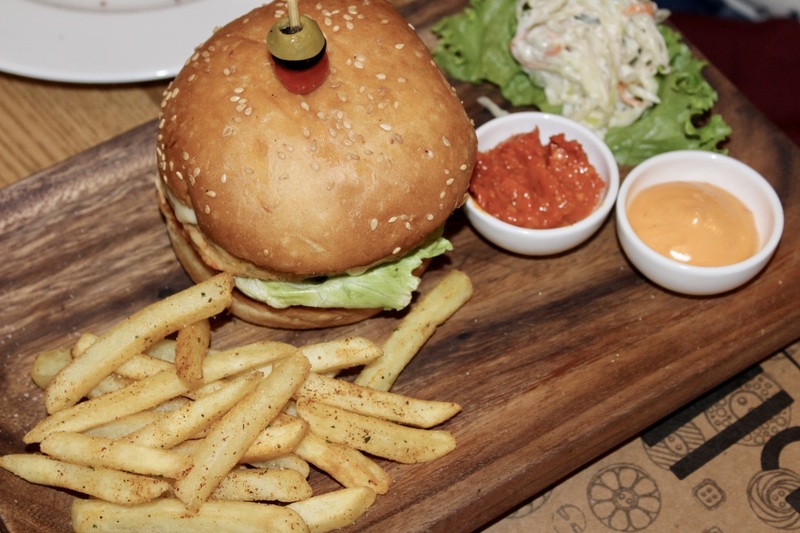 The Classic Pollo Burger arrived topped with cherry tomato and olives through a stick, it was served with fries, mayo, yell sauce and salad. I found it a little sweet because of the fried onions layered under the fleshy and soft chicken patty. 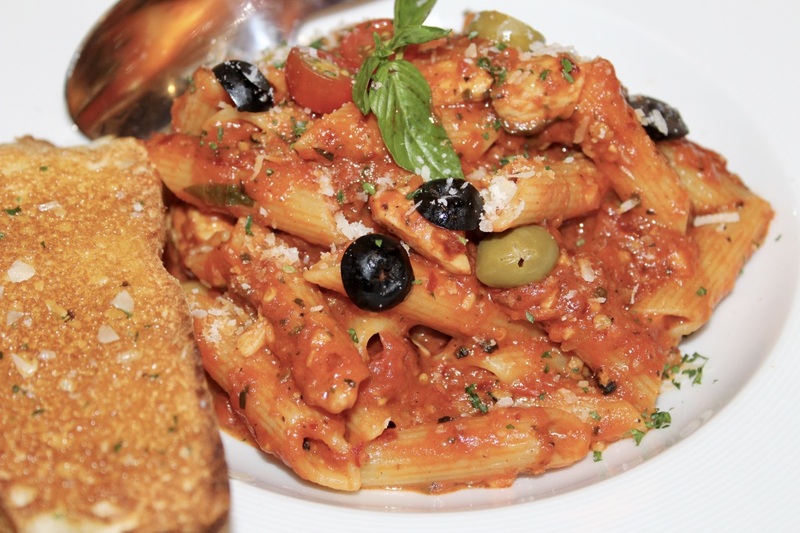 Checking the Pasta Section, we ordered Penne Arrabiata which was great and served with a slice of garlic bread. A nice, tasty, well made pasta which had a mild flavor with basil, cherry tomato, chilly flakes and chicken. An interesting section was Yell Meal from where I chose Khatta Butter Chicken. 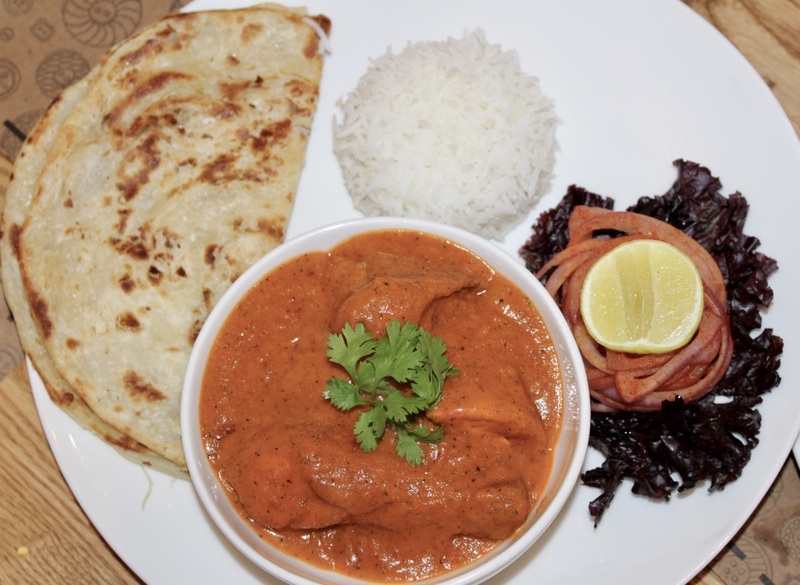 An interesting combination with tandoori chicken, raw tomato makhani curry, spices, fresh cream and butter. Served with a Malabar Paratha and a small portion of steamed rice, I would say this is one of the tastiest butter chicken I have had. Fleshy and juicy chicken pieces immersed in thick tomato gravy were heaven for a true Punjabi like me. I also loved the Malabar paratha which was distinctively made and was truly lacchedar. The Yell Watermelon Mojito was a refresher. We all know the magic watermelon does during the heat and that’s what this drink did to me! 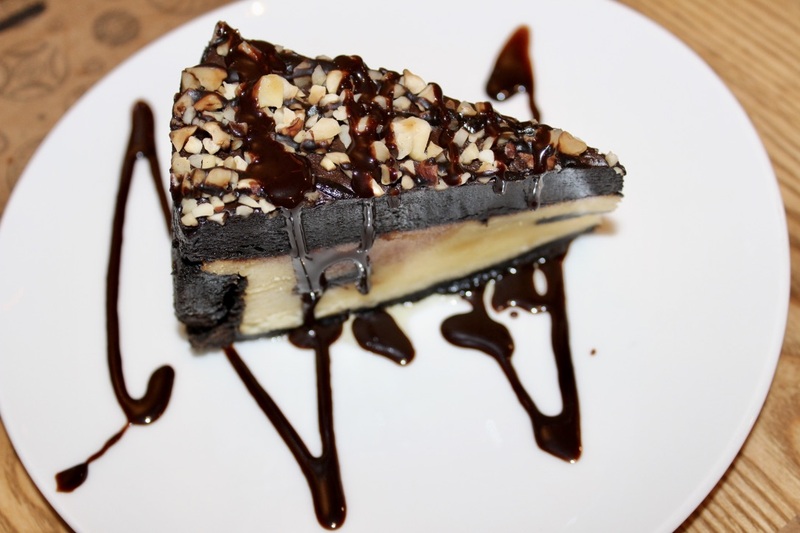 Coming to desserts, the Yell Cookie Blast was a blast in itself- layers of cheese cake, topped with chocolate and walnuts. Brownie with vanilla ice cream was yummmm! 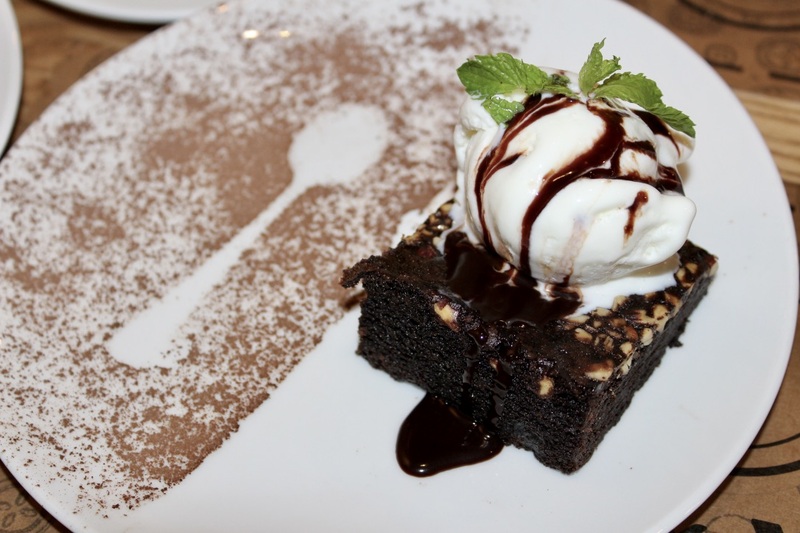 Soft brownie with nuts was presented topped with vanilla ice cream and layers of melted chocolate. Perfect neighborhood café to catch up with friends with light music buzzing in the background! 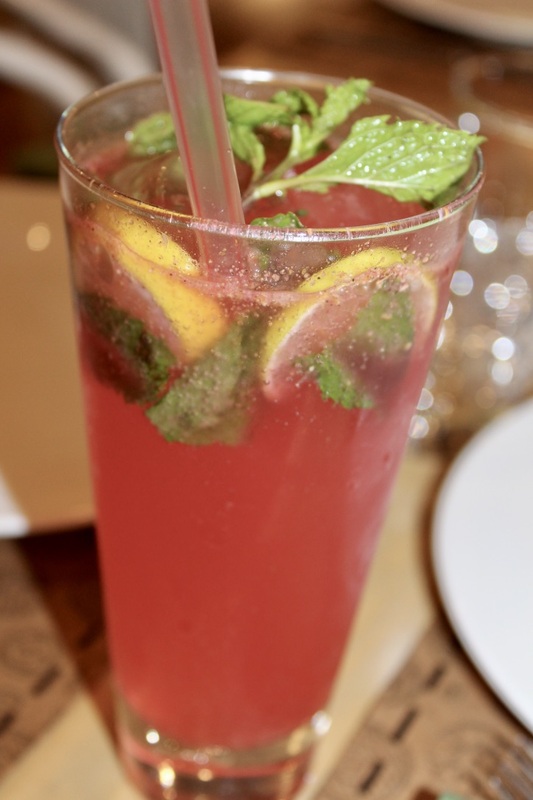 Relax yourself and indulge in lip smacking food, mocktails and coffee amidst the funky place!